Nobody tells a story the way NetEnt does. In fact, this studio has four other games inspired by legends in its portfolio. Maybe you’ve heard of Jack and The Beanstalk, Hansel & Gretel and Shangri-la? Well, they’re all NetEnt games! Anyhow, The Fairytale Legend: Red Riding Hood is an enchanting game that will captivate you. Very much like other fairytale slots by NetEnt, this game takes you back to your younger years. But also, it’s payouts could give your adult life a nice boost. Well, that is, if you’re lucky on the reels. Granted, that most people play slots to relax and a big win is just a plus! However, know that this slot has a low house edge and an RTP a little bit above average. So you stand a better chance to win if you play this game then other slots available at Parx Casino or PlaySugar House. 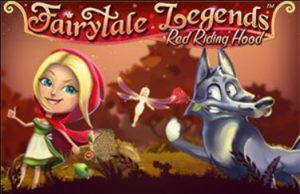 Summary of he Fairytale Legend: Red Riding Hood video slot features. Feature: 3 Fairy random features, Sticky Wild Re-Spins, Beware of the Wolf board game, Free Spins, multipliers and Coins Win. Pros and Cons for playing The Fairytale Legend: Red Riding Hood video slot. What’s great about The Fairytale Legend: Red Riding Hood video slot? In short, this game is not only a slot; it’s a board game! Indeed, when you play The Fairytale Legend: Red Riding Hood, 3 bonus symbols will give you a shot at activating the Beware of the Wolf board game. To activate the bonus, you’ll need to pick the right treasure chests in a mini-game. The Beware of the Wolf bonus is very interactive. In essence, you’ll make your way through the woods, and you’ll collect coins and multipliers. It is by far the best-paying feature of this slot since at the end of the path an 80,000 coins jackpot is up for grabs. It’s also worth knowing that the mini-game can give you an instant coin win or trigger the Free Spins bonus. All and all the treasure chests feature is very similar to the one you’ll find in The Fairytale Legend: Hansel & Gretel. What’s not so great about The Fairytale Legend: Red Riding Hood? Even if The Fairytale Legend: Red Riding Hood has two ways to trigger the Free Spins bonus, it’s worth knowing that you can’t re-trigger the Free Spins. Instead, you can win two additional rounds with every chest symbols that land on the reel. Granted that it’s not really a bad feature, but it’s worth keeping in mind to avoid disappointment if you were expecting 10 free rounds and only get 2 instead. It may take you many spins to activate all the features of this slot. Which is excellent since the gameplay delivers many surprises and it doesn’t get boring even when playing long sessions. But, know that it will cost you a bit (unless you’re lucky) to activate them all. Even if this game is packed with innovative features, it’s an easy game to understand. So you should give it a go! Plus it loads quickly on 3G and 4G connection so you can play it on your cell too! Why not try it out at Parx with a casino bonus?